The idea presented in Manuscript B must be read in strict association with the urban studies which Leonardo undertook between 1487 and 1489. Among his many commitments in those years, one of Leonardo’s chief interests was architecture. In this field, he reached his peak with the project of the ideal city on two levels, where his plan was to separate the areas destined for work and commerce from those intended for the leisure hours of the city inhabitants. His design was an attempt to produce a town planning project whose aim was to reduce the number of narrow, unhealthy streets of Medieval cities, where overcrowding and the close proximity of people and animals provided a dangerous breeding ground for the spread of infectious diseases. The new urban areas were to be laid out with geometrical precision, with plenty of open space, and built above a close network of canals that would serve as drains and as waterways for commercial traffic. 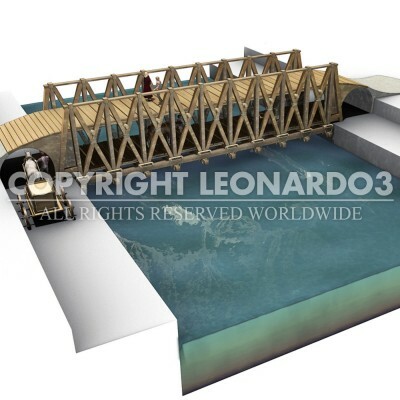 The idea of the double- deck bridge makes it possible to cross the water on two different levels and to separate the traffic entering and leaving the town. 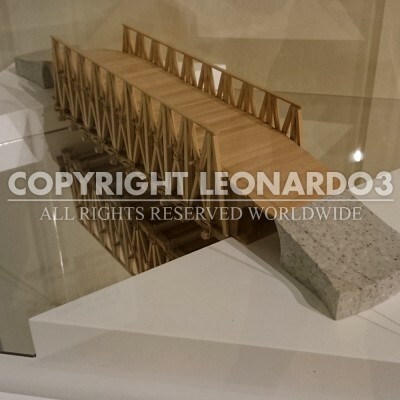 Alternatively, the upper level could be reserved for pedestrians and the lower one for vehicle and animal traffic, thereby completely implementing Leonardo’s town planning requirements. The design of this bridge is testimony to the idea of a truss structure and also is important because, above its value in urban planning, it seems to be a tangible experiment to optimise and gain the fullest possible advantage from a truss beam construction. This is achieved by using both vertical and diagonal supports, building the lower deck at ground level and the upper deck at half the structure’s height, resting on horizontal beams inserted at the point where the diagonal supports cross.